Building the pump track in the Sapwi Trails bike park. Trailbuilding Workshop – Save the Date: April 6-8, 2018 The Forest Service, in partnership with CORBA, the Mount Wilson Bicycling Association, IMBA, and the National Forest Foundation will hold a three-day trail workshop. The agenda is still being finalized, and official invitations and announcements will go out in the coming week, but you can save the dates of April 6, 7 and 8, April 2018. Details will be included with the Forest Service official announcement. Gabrielino Trail Restoration Update CORBA has been working behind the scenes on restoring the Gabrielino National Recreation Trail. The Gabrielino is the last trail still closed because of damage due to the Station Fire. It’s been an ongoing effort since 2011 to open up sections of the trail and then keep them clear of downed trees. The January 2018 eTerraTimes newsletter was posted Jan 3 CORBA’s first eTerraTimes newsletter of the year was posted today, January 3. If you don’t get it by email, you can the online version on our website. The Conejo Recreation and Park District is in the final stages of preparing the park for CORBA to build out the features within the park. The grading and clearing is completed. The staging for the amenities and fencing start in about 2-3 weeks. We’ve previously written about Sapwi Trails park progress. Here is our comprehensive October 2017 update, and information about IMBA’s fundraising drive to support the bike park. Come and join us to learn about current issues and let us know what concerns you! Always open to the public, the CORBA Board of Directors’ meeting is held the 4th Monday of the month in Woodland Hills. REI is kind enough to let us use their meeting room, for which we thank them profusely! Check our calendar to see when the next CORBA Kids Club ride will be held. 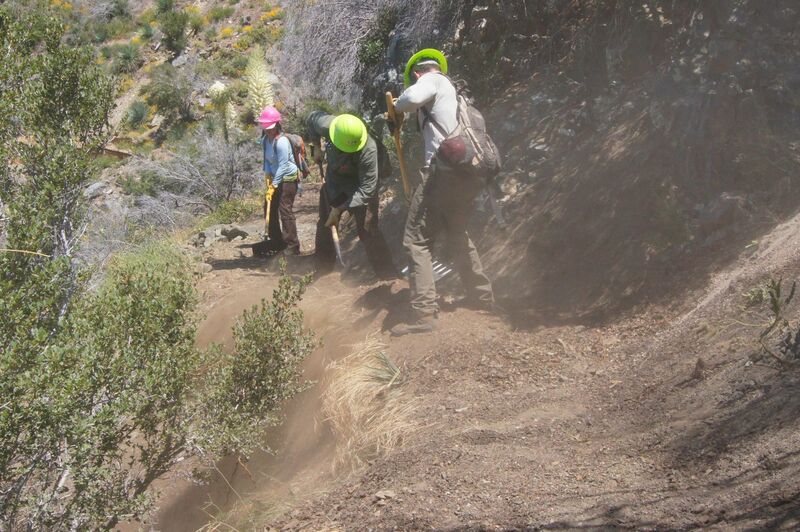 Saturday April 14: Backbone Trail Restoration from Latigo Canyon Road. 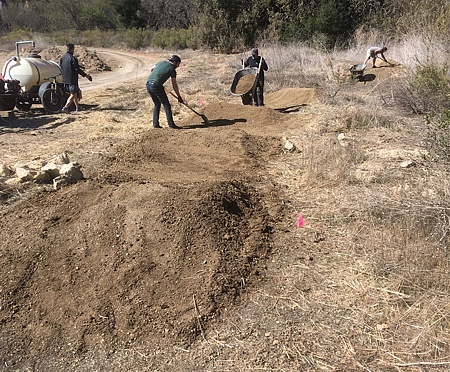 CORBA and the Santa Monica Mountains Trails Council will be joining forces again to fix ruts and clear brush on this popular section of the Backbone Trail. Please register online so we'll know how many people to expect. Full details are available on the registration page. Kanan Backbone Trail work on January 13. 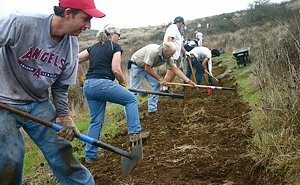 Nineteen volunteers from CORBA and the Santa Monica Mountain Trails council fixed or installed a total of 60 drains heading up the hill (east) over 1.4 miles from the trailhead on Kanan Road. We also cut back the brush over some of that section. See the complete summary in our trailwork blog article. 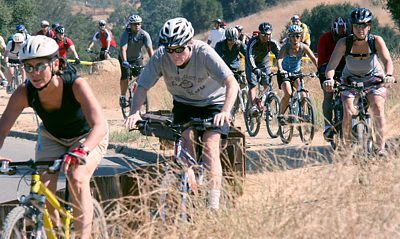 The Forest Service, in partnership with CORBA, the Mount Wilson Bicycling Association, IMBA, and the National Forest Foundation will hold a three-day trail workshop. The agenda is still being finalized, and official invitations and announcements will go out in the coming week, but you can save the dates of April 6, 7 and 8, April 2018. Details will be included with the Forest Service official announcement. Friday, April 6, will be an all-day classroom session at the Altadena Community Center. This day will cover the assessment, management and planning of trails, and will be of most use to those advocating for trails, planning to build trails or land and trail managers. Saturday April 7 will see a morning classroom session, followed by Saturday afternoon in the field, then a full day of hands-on on Sunday April 8. There is no charge for the workshop and lunch will be provided. If you’d like to attend contact us and we’ll let you know when registration opens. Saturday March 3rd is the next skills clinic, followed by April 7th.